The Mediterranean diet has been a lifestyle for many people living in the countries surrounded by the Mediterranean Sea. Because the diet shows much promise and health benefits, much research has evaluated the effects it has had on many chronic and degenerative diseases. And the studies are really promising: in particular, in turns out the Mediterranean diet can help fight three killer diseases: cardiovascular disease, dementia, and cancer. The Mediterranean diet encourages high consumption of fruits, vegetables, legumes, nuts, whole grains, and olive oil as the main source of fat. It is recommended to moderately consume wine, dairy products (mostly yogurt and cheese), fish, poultry, and seafood and limit your intake of red meat, sweet beverages, creams, and pastries. By changing your eating habits, you can decrease your risk of mortality by almost 10%. Adopting the Mediterranean diet rather than emphasizing intake of specific nutrients has shown to improve health and decrease mortality from cardiovascular disease by almost 10%! The Mediterranean diet emphasizes unsaturated fats—which are the good fats—over saturated fats, trans fats, and hydrogenated fats. Unsaturated fats improve lipid profile by lowering total cholesterol and triglyceride levels and increasing the good cholesterol; saturated fats have the opposite effect. Nuts also contain these “good” unsaturated fats—just make sure to limit your serving to a quarter of a cup, because the calories do count. Olive oil or other vegetable oils, such as canola, can help reduce the “bad” cholesterol levels and increase the “good” cholesterol levels. They contain some omega-3 fatty acids, which are known to improve your lipid profile; prevent plaque buildup, keep your blood vessels healthy; and keep your blood pressure in check. Fatty fish such as salmon, herring, or mackerel are also rich in omega-3 fatty acids, and have been shown to have many heart-healthy benefits. Because this diet focuses on a high consumption of plant-based foods, eating plenty of foods rich in antioxidants improves heart health. Legumes, nuts, vegetables, and whole grains are also all great sources of fiber, which have also been shown to lower cholesterol and improve cardiovascular risk. With increased life expectancies, prevalence of these neurodegenerative diseases have significantly increased, with a rate of one percent for those aged 65–69, jumping up to 30% for those over 90. While genetics play a large role in risk of dementia, there are preventative strategies, such as dieting, that have helped delay cognitive decline. Much research has evaluated specific nutrients associated with cognitive decline, such as monounsaturated fatty acids; omega-3 fatty acids; vitamins B12, C, and E; folate, and selenium. However, the evidence of the specific nutrients has been inconsistent. By choosing to adopt the Mediterranean diet lifestyle, you encompass all these nutrients which are rich in antioxidants, flavonoids, and carotenoids. Research has shown that people adhering to this healthy diet have a lower risk of cognitive decline and dementia. Further, adapting this diet as a lifestyle change has shown a 13% decreased risk of incidence of both Parkinson’s and Alzheimer’s diseases. The Mediterranean diet is associated with decreased inflammatory markers. A recent study demonstrated that a diet rich in olive oil diminished the expression of specific genes associated with oxidative stress and inflammatory processes; these are key mechanisms in the progression of Alzheimer’s disease. Research in this area is still evolving and is currently limited. However, the Mediterranean diet is a great lifestyle that best models a healthy way to meet your nutrient requirements. Many of you may have heard of various “anti-cancer” diets. 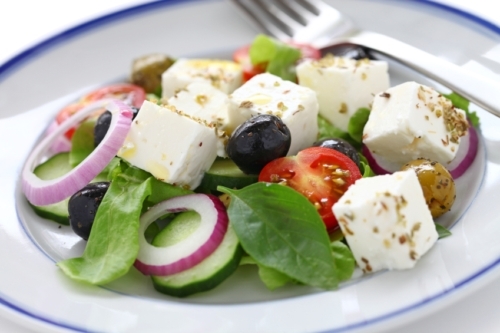 The Mediterranean diet encompasses much of what is suggested to help prevent cancer. While some studies show that this type of diet can prevent some cancers by up to 25%, a recent meta-analysis showed that it can decrease incidence or mortality of cancer by six percent. High intakes of fruits and vegetables have been associated with decreased cancer risk. While the exact nutrients have yet to be identified, it has been said that antioxidants and micronutrients such as vitamin E, selenium, and calcium can have an inverse relationship with the incidence of cancer, specifically breast cancer. A new study led by researchers from Ohio State University found that a compound called apigenin may be involved in interfering with the production of cancer cells. Apigenin may play a role in cancer cell death, or make the cells more sensitive to the chemotherapy drugs. This compound is most commonly found in chamomile tea, parsley, and celery, as well as other fruits and vegetables. There is also some evidence that non-starchy vegetables and fruit may play a protective role against mouth, larynx, pharynx, esophagus, and stomach cancers. These are good sources of fiber, which has shown to have an inverse relationship with colorectal cancer; therefore, high-fibrous foods, including whole grains, are recommended. Another dietary risk factor for developing cancer is the consumption of red and processed meat. Limit intakes to no more than 500 grams per week and minimize or cut out processed meat. A great alternative is fish, which happens to have many anti-inflammatory components, such as omega-3 fatty acids. By taking a whole diet approach, your risk of cardiovascular disease, neurodegenerative diseases such as Parkinson’s and Alzheimer’s disease, and cancer can be significantly reduced. By adapting a Mediterranean diet lifestyle and adding in 150 minutes of physical activity a week, you’ll have lots of energy and feel a whole lot healthier. Choose whole foods and limit your intake of any juices. Half of your plate at each meal should be filled with a variety of vegetables. Cut up some vegetables and have them handy to grab on the go—they make for a great snack! Try to include one dark green and one orange vegetable each day. Whenever possible, choose whole grain or whole wheat breads, pastas, and rice. Whole grains are full of great nutrients and fiber. Nuts and seeds are great sources of protein and are rich in the good fats. Just be careful with your servings sizes (1/4 cup, or about a handful), as the calories can add up. Consider using nut butters (a great alternative to cream cheese, butter, or margarine). Choose natural nut butters such as peanut, almond, or cashew butter (serving size is two tablespoons). Eat fish about twice a week. Healthy choices that are rich in omega-3 fatty acids include salmon, mackerel, herring, or sardines. Choose good fats like olive oil, or other vegetable oils, such as canola, rather than saturated fats, such as butter. Try not to consume any red meat more than twice a month. No more than 500 grams of red meat should be consumed in a week. Consider leaner sources of protein, such as fish or poultry. Also, watch your portion sizes (about the size of the palm of your hand). Avoid highly processed meats such as sausages, hot dogs, lunch meats, and bacon. Milk and yogurt products should be less than two percent milk fat. Select cheeses that have a milk fat content of less than 20%. Féart, C. et al., “Potential benefits of adherence to the Mediterranean diet on cognitive health,” Proc Nutr Soc 2013; 72:140-152. La Vecchia, C., “Mediterranean diet and cancer,” Public Health Nutrition 2005; 7(7):965-968. Ohio State University, “Compound in Mediterranean Diet Makes Cancer Cells ‘Mortal,’” ScienceDaily web site, May 20, 2013; http://www.sciencedaily.com/releases/2013/05/130520154303.htm, last accessed July 18, 2013. Sofi, F., et al., “Accruing evidence on benefits of adherence to the Mediterranean diet on health: an updated systematic review and meta-analysis,” The American Journal of Clinical Nutrition 2010; 92:1189-1196.